Because the piano is such an important element in classical music, the influence of Frédéric Chopin is undeniable. 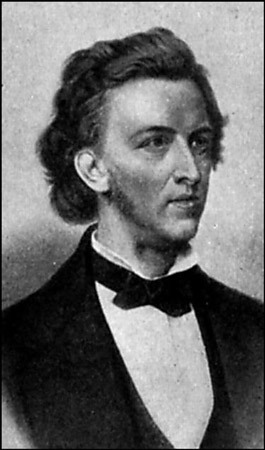 Frédéric Chopin (1810–1849), a thin, frail virtuoso pianist from Poland. Chopin (“sho-PAN,” except that you don’t really pronounce the final N; instead, you send it flying through your nose) single-handedly revolutionized the world of piano music. He changed everybody’s idea of what was possible on the piano (intimate, brilliant, singing, diverse tone colors) and what was not (apparently nothing). Keep reading for more information about Chopin. Frédéric Chopin revolutionized the sound of the piano. Like so many other composers, Frédéric Chopin was a boy wonder. At age seven, he published his first composition in Poland; only a year later, he made his debut as a concert pianist. His childhood was rich with the sounds of Poland’s national dances, such as the polonaise and the mazurka — musical influences that filled his head and his music forever after. Frédéric composed all his pieces at the piano, and he loved to improvise as he performed them. In fact, he hated to write them down, because that meant freezing them in one form. Unfortunately, all of Chopin’s on-the-spot genius is lost to history; in those days, video recording was still in the testing labs. After Chopin came to Paris at age 21, his virtuosity caused a sensation; nobody had heard music like his before. Unfortunately, because he was so fragile and sickly, he couldn’t play many concerts. Still, he managed to support himself by selling his compositions and giving piano lessons. He limited his live performances primarily to small, less stressful “salon” concerts — concerts in somebody’s home. In these, he was wildly successful. Chopin is known to have had little hands. Yet even with such small hands, young Frédéric sure could get around the keyboard. His music is a flurry of notes, like a whirlwind, flying from bottom to top and back again. His music is warm, romantic, and tender; in a typical Chopin recording, you don’t often hear the sounds of agony and pain (except possibly from the pianist). If you think that you’ve never heard Chopin, you’re wrong. The famous funeral march music, so somber and lugubrious, so often borrowed in Road Runner and Bugs Bunny cartoons, is by him; it was originally part of a piano sonata. And then recall that old Barry Manilow hit “Could It Be Magic”; take away Barry’s voice, and the piano part that remains is unmistakably Chopin’s Prelude opus 28, no. 20 in C minor.